Would you like to regain hours of your life back a month? Are you aware that over 90% of all cyberattacks on computers start in email? Help stop cybercriminals and stop 99% of junk email before they reach your Inbox with our Spam Protect service. It's so good you may soon forget to check your quarantine account and simply enjoy a productive spam free inbox. "I continue to be impressed by the Spam Protect program. Once your order has been placed and we have set up your account on the Spam Protect Server you'll be sent setup instructions the same day. Setup instructions will include a web page link and username/password for use with your online quarantine Message Center. We will assist you in updating your MX record once you give us the OK to do so. 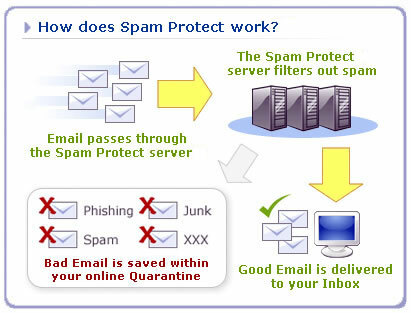 Once your MX record has been updated, email will route to the Spam Protect Server. Only email accounts or aliases you've requested to have filtered will be filtered. Other email accounts will route directly to your email account without filtering. Good email will be delivered to your email account as usual. Other email will be quarantined in your separate quarantine account. You may continue to use other email filter services for both your filtered or unfiltered email addresses (like Spamassassin). All email accounts are filtered, and quarantine reports are optional (i.e., you may turn them on or off for any email address as needed). You may likewise filter other email addresses at other domain names by forwarding those email accounts to your filtered email address. If for some reason your email service is down or overloaded your email will be queued within your quarantine account then delivered once email service has returned to normal operations. You may even view your queued email online by logging into your quarantine account. The quarantine account will retain quarantined messages for weeks then will remove them automatically. The Message Center allows you to approve or block senders, manage the aggressiveness of your junk email settings, and even assign higher or lower blocking scores for different categories of spam (like adult, special offer type email, etc.). Order Spam Protect with Quarantine service?